Our senior dental assistant, Fiona, who has been working for Joshua's office for more than 10 years ordered a cake for her mother-in-law's 76th birthday. She wanted the chiffon cake with taro root mousse filling. I'd like to decorate it a little differently than the usual roses with shell border birthday cake, and I wanted it to express the love and best wishes from Fiona, so I decided to make it with a Chinese birthday wish theme. 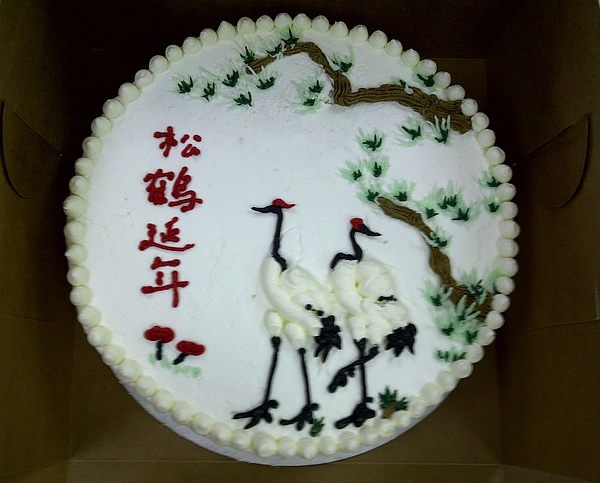 Pine and crane together is a popular motif when it comes to birthday wishes since both pine and crane live long, so I decorated it with a Chinese watercolor painting of pine and crane. I also like the two red "Ju-Yi" fungi under the Chinese characters, they are supposed to promote our health and make us live forever!! LOL Cute!